(Old Jap 120 127 6×9 4×6 camera ca. 1945). Given the brackets, I suspect I almost never used it. This may be the camera that my that I got from my father, also a keen photographer, in 1956. It's possible that he bought it when he was in Tokyo in August or September 1945. It seems that the Diaxettes came with different shutter speed ranges. I don't think that mine had a 1/300 s shutter speed, and I can't recall whether it had any speeds below 1/25 s. Cees-Jan confirms that the top speed of the Pronto shutter was 1/200 s. It didn't have a rangefinder. Some of the photos were taken with a screw-on “telephoto” lens that doubled the focal length and caused serious vignetting. I can't remember much else about the camera. In the time frame 1964 to 1965 I also had a Nagel Vollenda with a 105 mm f/4.5 Tessar and a Compur shutter. My notes say “6×9”, so I assume this used 120 film. It seems that this was a particularly rare combination. Most of the Vellndas were model 48, and from the image size this would have been a 70 or 72. But most of those were supplied with Schneider-Kreuznach Radionar 105/4.5 lenses. As to your Ikonta, it might have been a Nettar, as that's not just the name for some lenses but also a range of Zeiss cameras similar to Ikontas but generally lower spec, Ikontas usually had Tessar lenses. In contrast to my camera, this one takes the smaller 120 film and has a Novar-Anastigmat 110/4.5. This camera has the 55 mm f/2 Super-Takumar, which was normally supplied with the cheaper S1a model. On 26 June 1966 the camera developed shutter problems, and I sent it in for repair. I then sold it to a schoolmate and never used it again. 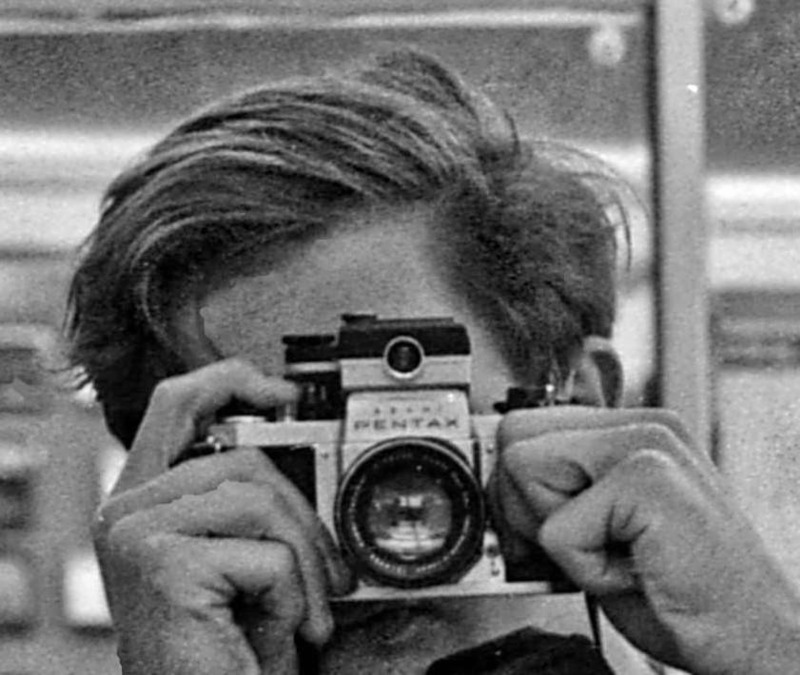 In 1966, I started carrying two cameras with me. The first “second” camera was a FED, a copy of a Leica II<something> with a genuine Leica top plate, serial number 212408, which I bought in Plymouth on 2 April 1966. It came with a 50 mm f/2.0 (Leitz) Summar lens, serial number 217679. 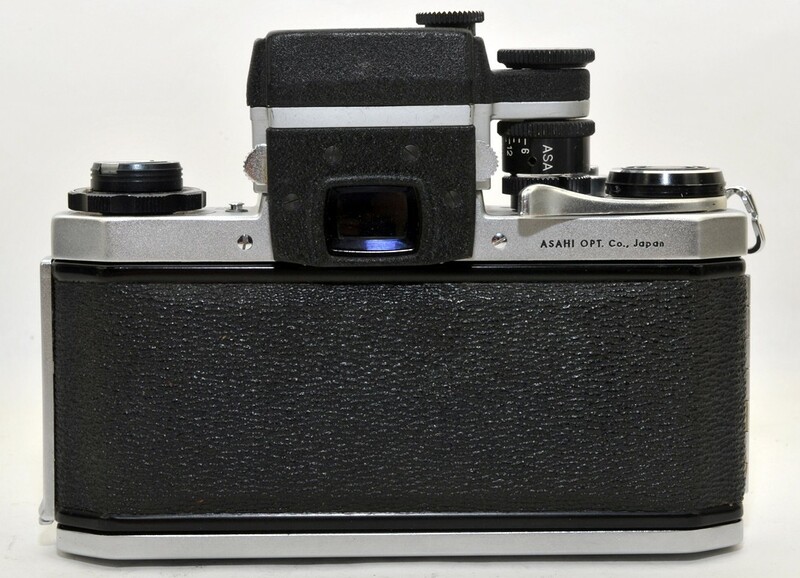 It was sold to me as a Leica, and I didn't find out that it was a Fed until I tried to sell it to a camera dealer, only 10 days later. It wasn't a very nice camera; bottom loaders are a real pain, whether they're genuine or not. I only took three films in it, and one of those I transferred to another camera before it was finished. On 14 July 1966, only three months later, I gave it to my girlfriend, Jenny Hallett. It was compatible with the Pentax lenses, and I didn't buy any further lenses for it. I took 26 films with it and sold it on 20 September 1967 to the same (now ex)-girlfriend to whom I had given the “Leica”. Clearly she hadn't liked it either. 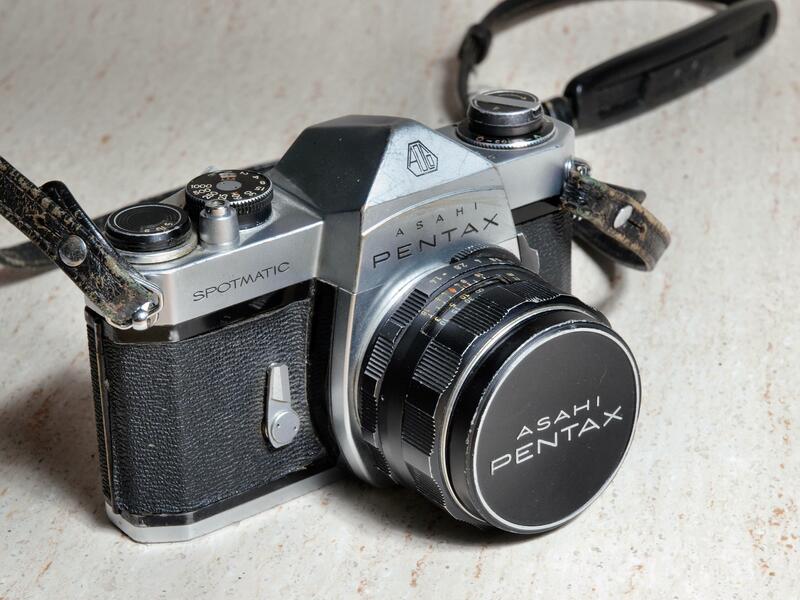 In June 1966, I sold the SV, and on 5 August 1966 I got an Asahi Pentax “Spotmatic”, serial number 1182896. 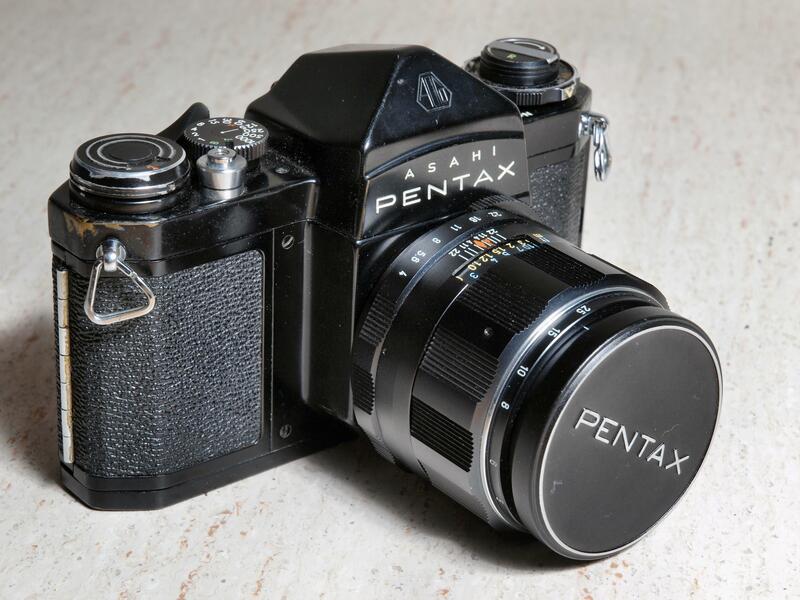 This was the first mass-produced SLR with through-the-lens metering. Apart from these details, it is very much like the SV. I still have this camera, though now the serial number on the camera is 1211890: it got damaged during our road trip from Singapore to London, and the top plate, including “serial number”, was replaced by Asahi Optical in Hamburg. 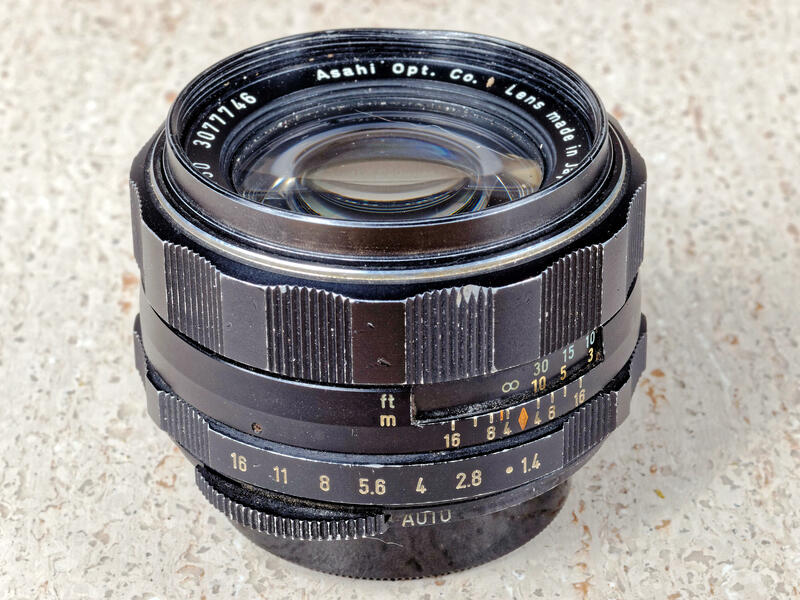 The serial number of the original lens (50 mm f/1.4 Super-Takumar) is 1591394, but I swapped lenses with my father some time in the late 1960s, and the lens I have now has the serial number 3077746. The original lens was the 8 element version, the “new” one is the 7 element version with the radioactive rear element. It's interesting to look at pricing then. My father bought the camera in Singapore, before the Malaysian and Singapore currencies split, and I paid MYR 370.00 for it, at the time equivalent to UKP 44.60. At the time the British price was £150. It's difficult to calculate the modern equivalent, but my take is that a British shilling then was worth the equivalent of £1.50 today, in other words a devaluation of about 97%. That would make the prices equivalent to £1,338 (USD 2,200) and and £4,500 (USD 7,400) today. Also in 1966, I think, I inherited my father's Bolex B-8 standard 8 mm ciné camera. It had two lenses on a rotor. They appear to have been a 13/1.9 Yvar (serial number 322 945) and a 36/2.8 Yvar (serial number 296 345), not quite the 12.5 mm and 36 mm mentioned in the instruction manual. I didn't use it much, and I no longer have it or any films I took with it. 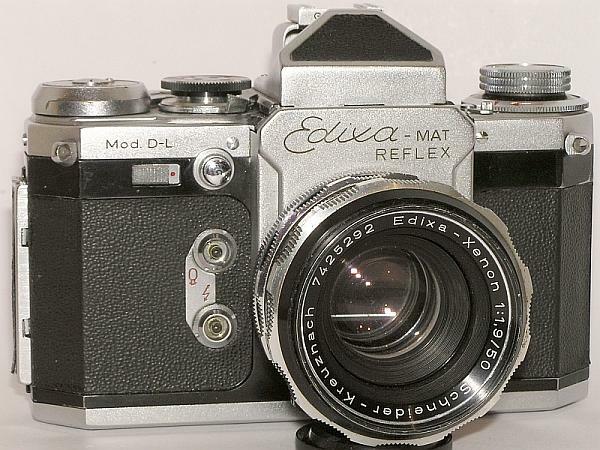 On 15 September 1967 I bought an Edixa-Mat Reflex D, serial number 273 753. This camera had better specs than the Edixaflex, including shutter speeds to 9 s and automatic diaphragm control, but still no light meter. 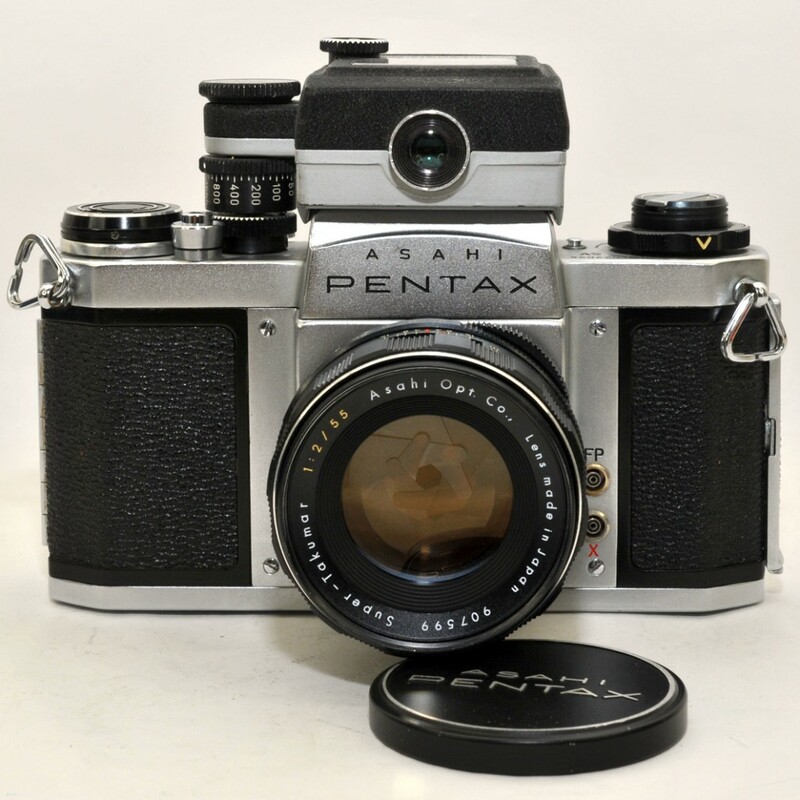 It also came with another PRIVI pentaprism, serial number 544155. 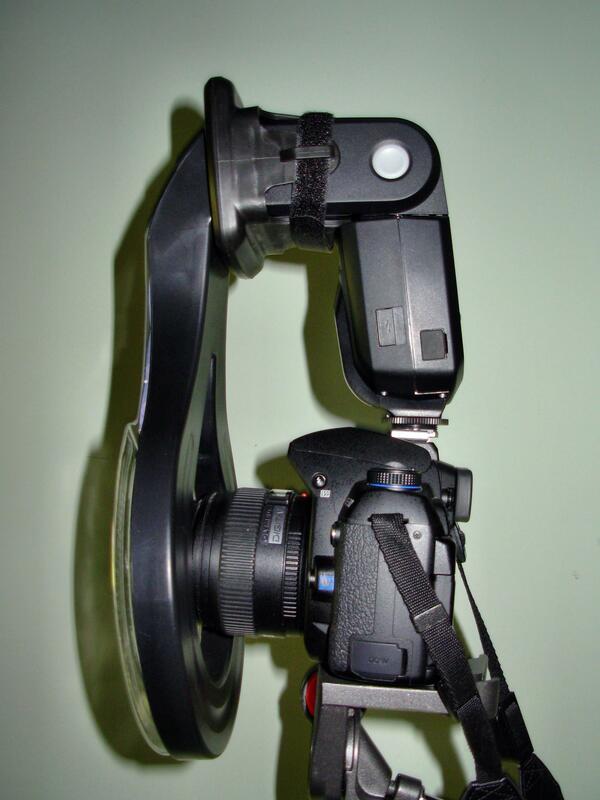 With this camera I had some difficulty with the automatic diaphragm actuation, as described here. It was a body only. The only photo I have of it is a crop from an unrelated image, but the second image looks pretty similar. 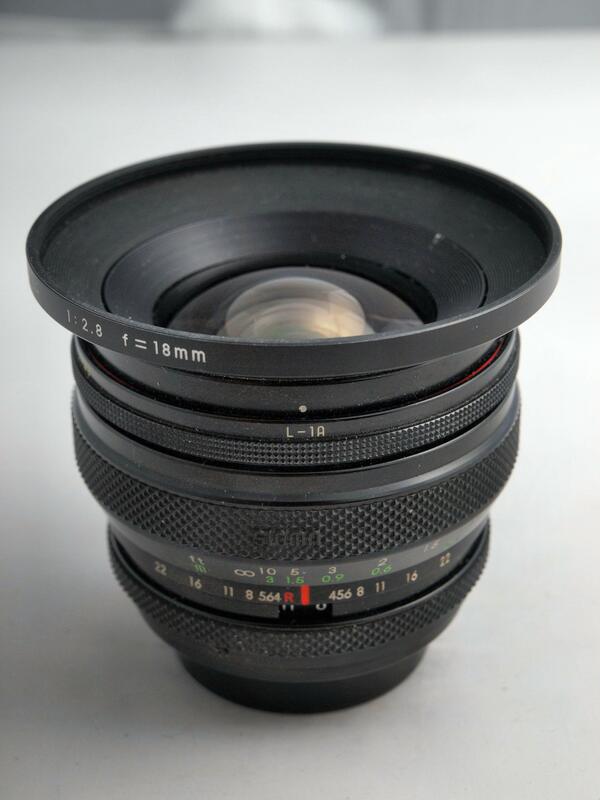 The lens might be the 135 mm f/3.5 Super Takumar, and it looks as if it has the waist-level viewfinder connected. Some time after 1968 I took over my father's Canon IV S2 rangefinder, serial number 196485, along with two Canon lenses: the standard 50/1.5, serial number 19494, and a 28/3.5 wide angle lens, serial number 16730. It's interesting to look at the lens serial numbers: this equipment must have been some of the first that Canon made. The comments on this page suggest that it was made for the US Forces, and was otherwise the same as the Canon IV SB. 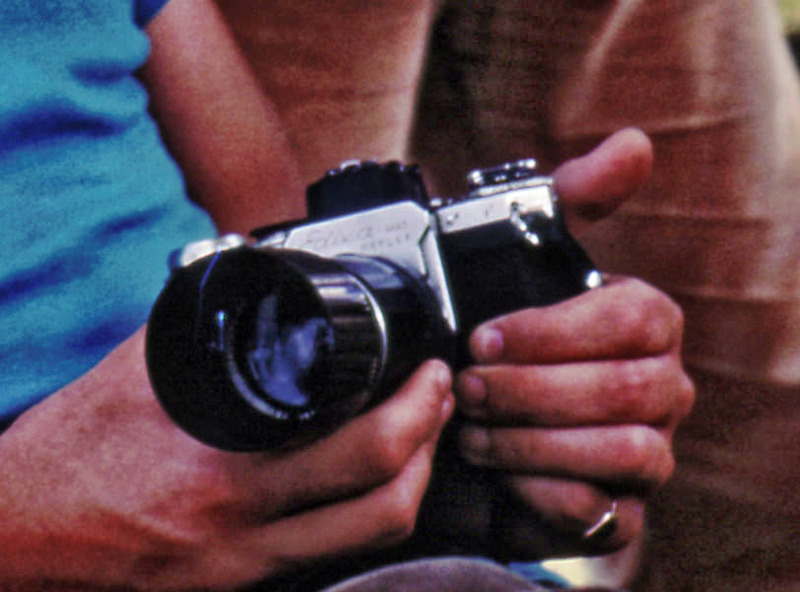 I didn't use this camera much, and in 1970 I gave it to my girlfriend, Sue Fortescue. I also bought a 90 mm f/4 Leitz Elmar to go with it. It was stolen from Sue some time in 1971. In August 1992, I bought a Pentax Z1, serial number 5858549, with a 28/85 mm f/3.5-f/4.5 zoom, serial number 3262646. Somehow I have never used it much. It's strange that over the years cameras have become effectively less sensitive. In the mid-60s I used films with sensitivities between ISO 64/19° and 400/27°, with a maximum aperture of f/1.4. With the Z1 I would have needed film sensitivities between ISO 500/28° and 3200/36° to make up for the much smaller aperture. In July 1998 I bought my first digital camera, a Casio QV-5000 SX, one of the first affordable cameras with 1 megapixel. It lasted about 8 months before failing. I sent it for guarantee repairs, which took 6 months; it arrived back unrepaired. The second time I sent it off was the last I ever saw of it. It never came back. I won't forget Casio for that treatment. In retrospect, the camera wasn't much good anyway. Take a look at the photos I took with it: the lens was of very poor quality. In October 2000 I bought a Nikon “Coolpix” 880, with 3 megapixels and a decent lens. It is quite a nice camera, but slow, and it is particularly bad at rendering skin tones: it makes people look as if they have been drinking excessively the previous night. In November 2004 I bought a Ricoh Caplio R1 digital camera with 4 mexapixels. The advantages it had were that it had a real wide angle lens (corresponding to 28 mm on a 35 mm camera), and that it was very fast. On the down side the flash exposure was pretty terrible, to the point of being useless on some occasions. Still, I was happy with it until on 19 March 2006 I dropped it on the floor in the cathedral in Amalfi, which it didn't survive. The next camera is a 6 megapixel Nikon “Coolpix” L1, which I bought in a hurry on 19 March 2006 in Amalfi after accidentally destroying the Ricoh. It has many advantages, but also the slowness and poor skin tone resolution of the Coolpix 880. It doesn't have any wider angle lens than average, either, and strangely, it also doesn't have any way of adjusting the sensitivity: it's stuck at ISO 100. It also seems to get through batteries very quickly. It came with four Sony NiMH batteries (two pairs), and they were the only NiMH batteries that worked with it: all others give up after less than 10 exposures. At the time of purchase it was very new on the market—the examples in the instructions show dates a couple of days after I paid for it—and it was the only SLR camera on the market with both image stabilization and composing via the LCD monitor (which they call “live view”). It's amusing how times have changed: 50 years ago SLRs showed images through the viewfinder until the photo was taken, and then it went dark. I sold this camera on 1 August 2009 after replacing it with the E-30. In September 2007 I bought an Olympus OM-10 camera with a 50 mm f/1.8 Zuiko standard lens and a 80-210 mm Tamron telephoto lens, mainly for the latter. I only ever put one film through the camera, and I sold it again after I got a replacement telephoto lens. 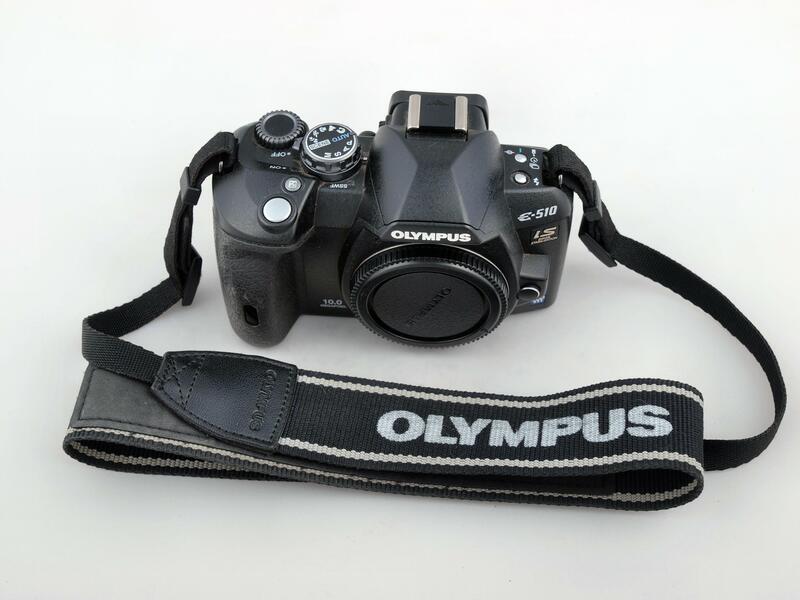 In May 2009 I bought another Olympus, an E-30, serial number G67502432 to replace the E-510. On 1 August 2010 I bought an Asahi Pentax SV, serial number 610300. That's right, the same model that I bought 45 years earlier. Judging by the serial number, it's considerably older than the first SLR. Clearly it was second-hand, and I don't intend to use it (it doesn't even have a light meter! ), but it came bundled with the SMC Macro-Takumar 50 mm f/4 shown in the photo, which I wanted to use for macro photos that my Olympus equipment can't do. On 3 December 2013 I received an Olympus OM-D E-M1, serial number BHP228512. I'm still learning about this one; see my experiences and opinions. On 4 January 2017 I received a used Olympus E-PM1, serial number BBP501084. It's intended for backup use only, and has a problem with the on-board buffer battery: when I remove the battery, it forgets the date. It's unlikely to see much service, but the price was right. On 23 February 2017 I received my sixth Olympus body, an OM-D E-M1 Mark II, serial number BHUA20626. On 23 May 2018 I took delivery of an Edixa Reflex, serial number 152145. with pentaprism and waist level viewfinders, two focusing screens and a Steinheil Cassar 50 mm f/2.8 lens, serial number 1670265. 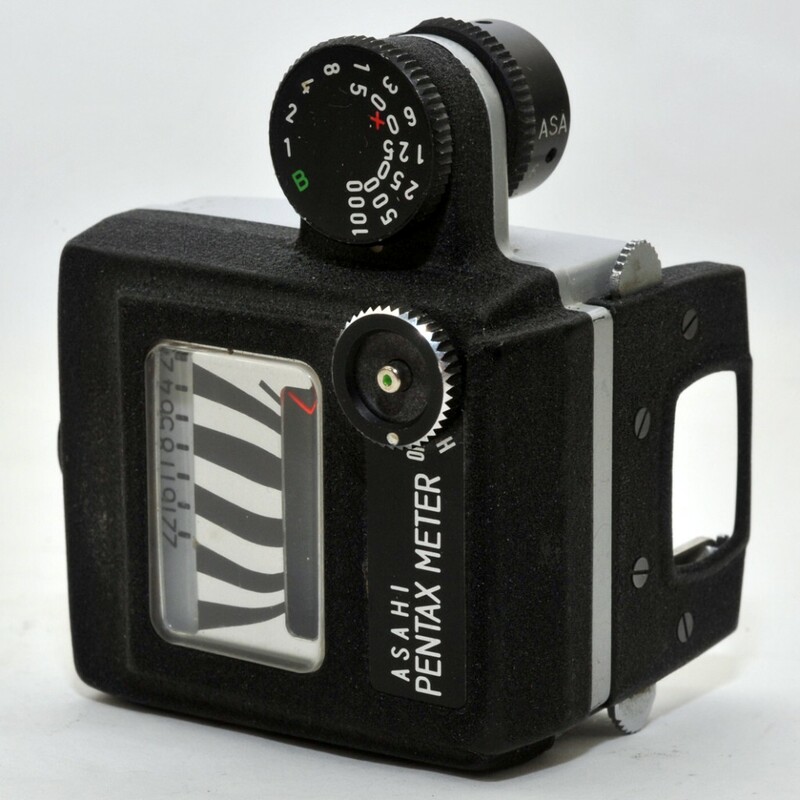 The pentaprism has the serial number 231469. Most of my cameras have had interchangeable lenses, and I've had a number of them. The list can't be exhaustive, of course: it's easy and interesting to try other people's lenses, and I can't recall all the lenses I have used. Here are the 20 lenses of various descriptions that I had on 10 May 2014. 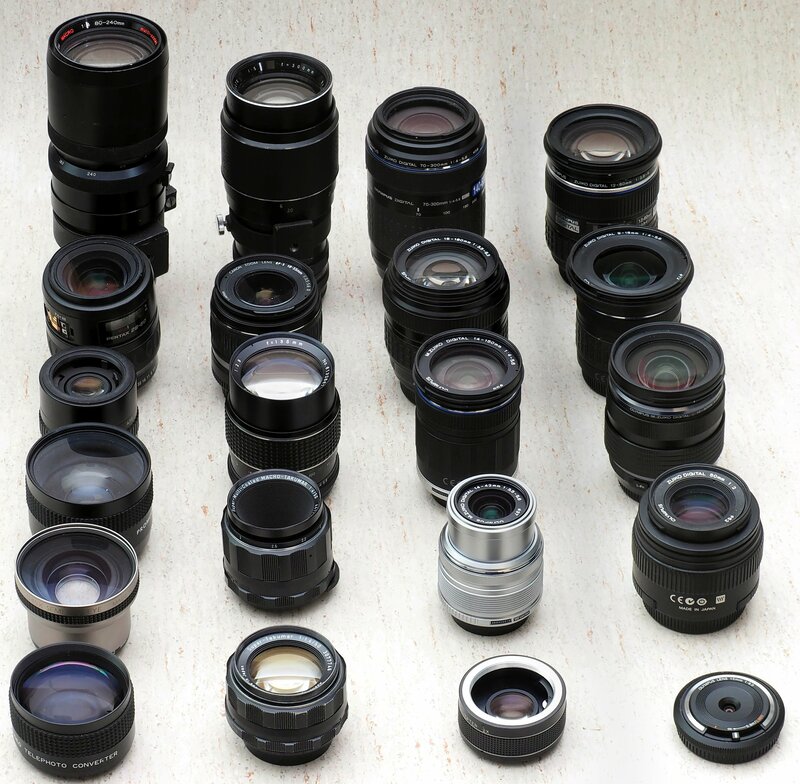 Only 13 of the lenses can be used on my Olympus cameras, and only 9 of them are intended for that system. 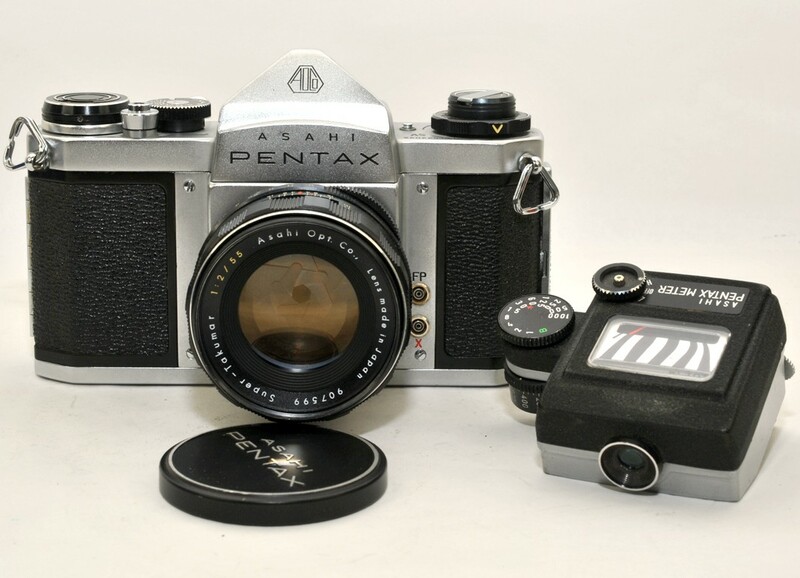 The Asahi Pentax SV that I got on 24 July 1965 came with a 55 mm f/1.8 Super Takumar standard lens, serial number 1214486. Apparently at the same time I also bought a 135 mm f/3.5 Super Takumar, serial number 1317865. On 6 September 1965 I bought a 400 mm f/8 Soligor telephoto lens, serial number T 393329 and a 3× Soligor teleconverter. I don't know what happened to the lens; I think that it must have been stolen from our house. On 8 January 1966 I bought a Super-Takumar 28 mm f/3.5 wide angle lens, serial number 1364964. With the Spotmatic I received a 50 mm f/1.4 Super Takumar lens, serial number 1591394. I later swapped this lens with my father's newer version of the same lens, serial number 3077746. Of these, I still have the second 50 mm Super Takumar, now with yellowed glass. The 28 mm and 135 mm lenses were stolen in Milano (see above), and the 400 mm lens disappeared some time round 1997, possibly when we moved back to Australia. After the loss of the lenses in Milano, I immediately bought a 28 mm f/2.8 wide angle lens, and later my wife Doris and I bought some relatively cheap lenses the name “Exaktar”, a 35 mm f/2.8 and a 135 mm f/2.8. The serial number of the latter is 6132867. When we split up, she kept the 28 mm and 35 mm lenses and I kept the 135 mm lens. I also bought an 18 m f/2.8 Sigma extreme wide angle lens, which I sold again in July 2009. 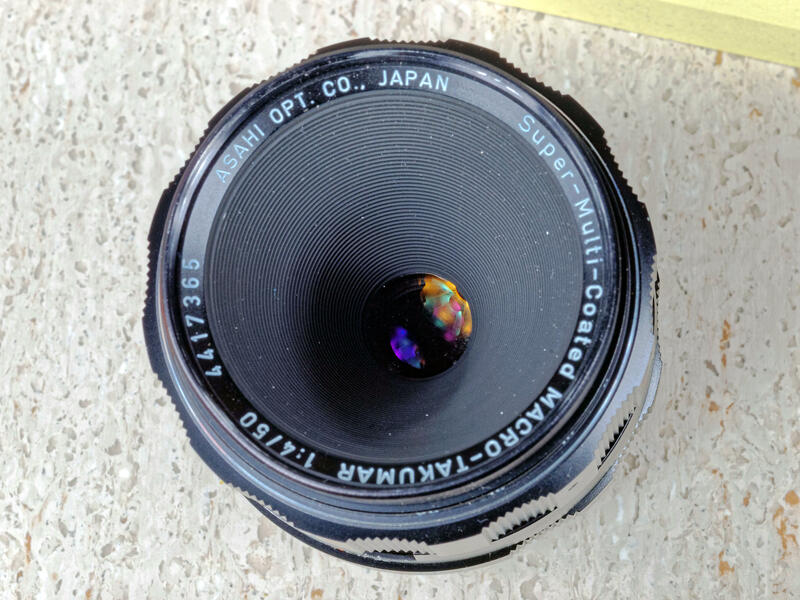 On 16 June 2017 I received another M42 lens, again as a bundle with an Asahi Pentax bellows unit. 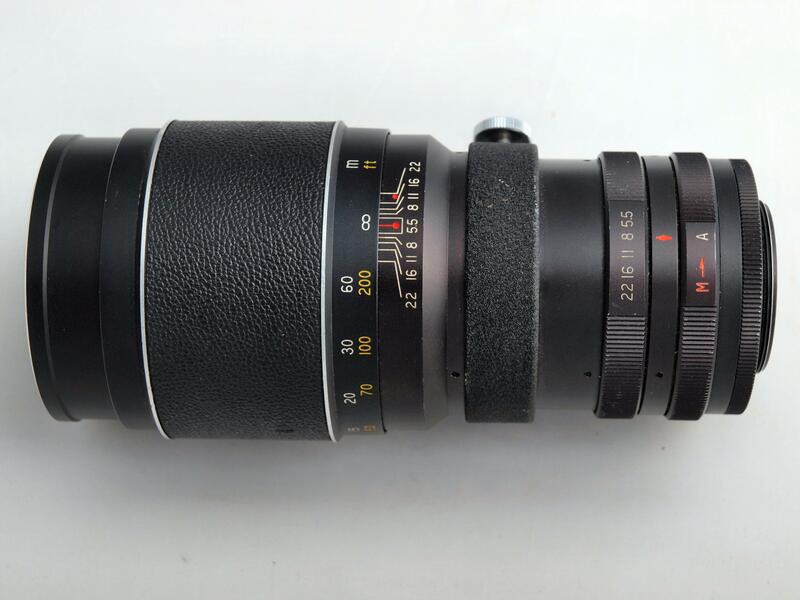 The lens is a Raynox 35 mm f/2.8, serial number C52650. It's interesting because it's the first lens I have seen that specifies an angle (63°), the diagonal field of view when mounted on the full-frame cameras for which it was intended. It also has the text Ww, which might indicate German „Weitwinkel“ (wide angle). 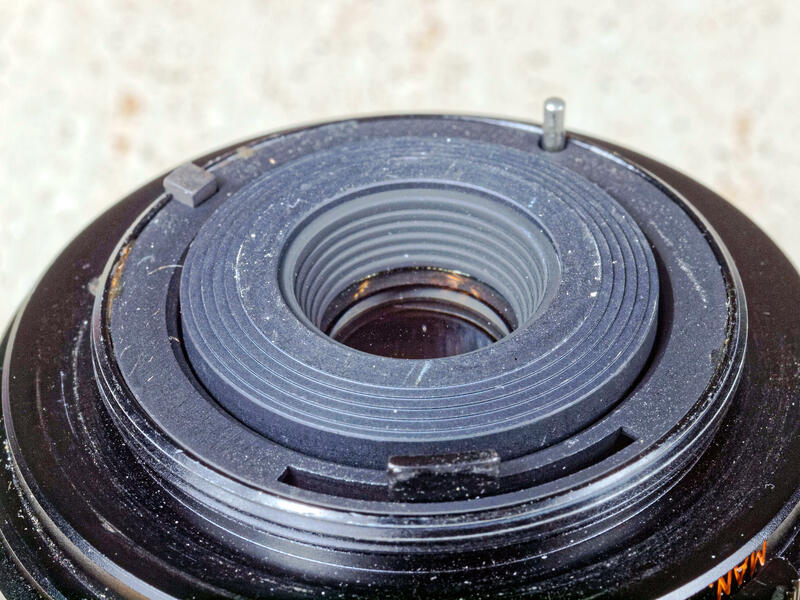 It also has a defective focus ring or mechanism, something that is of little concern when mounted on bellows. As I mentioned, I never used the Pentax Z1 much, but I did buy one lens for it, along with the Hanimex, a 80-240 mm f/4 Sun Zoom. I bought it mainly because the price was right: there's something mechanically wrong with it, and it no longer focuses to ∞ at shorter focal lengths, but I got it for $10 as a result, and it still works at the longer lengths. With the OM-10 I also got a 50 mm f/1.8 Zuiko standard lens. I used it a couple of times, but it had nothing to offer that the 50 mm f/1.4 Super-Takumar didn't. In May 2008 I replaced the Tamron telephoto with a Zuiko Digital ED 70-300 mm f/4.0-5.6 long telephoto lens (equivalent to 140-600 mm on a full frame camera), serial number 825610007. I sold it exactly 9 years later, on 1 May 2017. In September 2008 I replaced the Zuiko Digital ED 14-42 mm f/3.5-5.6 standard lens with a Zuiko Digital ED 12-60 mm f/2.8-4.0 SWD (equivalent to 24-120 mm on a full frame camera), serial number 230033616. In May 2009, along with the E-30, I bought a Zuiko Digital ED 9-18 mm f/4.0-5.6 ultra wide angle lens (equivalent to 18-36 mm on a full frame camera), serial number 300102323. Hugin calculates the minimum focal length at about 8.8 mm, though I'm not sure whether this isn't due to incorrect assumptions based on the aspect ratio. In August 2009 I bought a Zuiko Digital ED 50 mm f/2.0 Macro lens, serial number 192054704. On 6 November 2012 I bought a second-hand Olympus Zuiko Digital 18-180 mm f/3.5-6.3, mainly for convenience, since the 12-60 and 70-300 lenses already cover just about all this range. I didn't note the serial number, and the EXIF data doesn't report it. It proved to be quite useful, though. Unfortunately, the focus speed with the E-PM2 was not very impressive, so I replaced it with the Olympus M.Zuiko Digital ED 14-150 mm f/4.0-5.6, and sold it on 14 July 2015. On 4 December 2013, the day after receiving the E-M1, I received the new M.Zuiko 12-40 mm f/2.8 Pro lens, serial number AC5218267. I sold it on 28 April 2017. With Yvonne's Olympus E-PM2 came an Olympus M.Zuiko Digital 14-42 mm f/3.5-5.6 II R lens, serial number ABH956018. 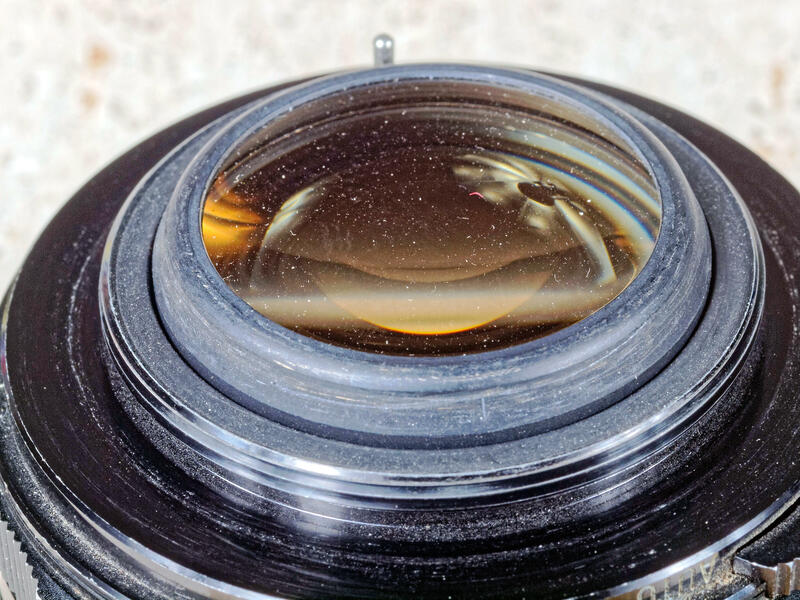 On 2 May 2014 I received a Olympus BCL-1580 15 mm f/8 Body Cap Lens, apparently without a serial number. It's a tiny bare-bones lens intended mainly for Yvonne to use when she's riding. I sold this lens on 27 December 2015. On 9 May 2014 I took delivery of an Olympus M.Zuiko Digital ED 14-150 mm f/4.0-5.6 lens, serial number AAK208277. Unfortunately, this lens proved to be defective, and I returned it a few days later. Instead I bought a new Olympus M.Zuiko Digital ED 14-150 mm f/4.0-5.6 lens, serial number AAK263738, which arrived on 16 May 2014. On 4 July 2014 I received a second-hand Olympus Zuiko Digital ED 8 mm f/3.5 fisheye lens, serial number 156003301. The EXIF data doesn't include the number (which it reports as 000000000). The body cap lens is really not a very good lens, but Yvonne likes it because it's small. So on 17 October 2014 I got her a second-hand M.Zuiko Digital 17 mm f/2.8 Pancake lens, serial number AB9202060. It's barely larger than the body cap lens, but has much better image quality. But Yvonne didn't use it much either, so I sold this lens on 27 December 2015. The 17 mm pancake still wasn't enough for Yvonne. She had a rather valid issue that she wanted to be able to put the camera in her pocket, pull it out again and take photos. With the pancake she could put the combination in her pocket, but on taking it out she first had to remove the (tiny) lens cap, and that's not easy when riding. On 30 September 2015 we received a M.Zuiko Digital ED 14-42 mm f/3.5-5.6 EZ lens, serial number AC4B13531. It's only marginally larger than the 17 mm lens, but an automatic lens cap is available for it. We bought one of them too, a JJC Z-O14-42S aftermarket version, only half the price of the Olympus part. It jammed when we got it, but after a bit of washing it seems to be working OK. Others have confirmed that they have had no trouble. On 17 October 2015 I took delivery of a second-hand Olympus Zuiko Digital 35 mm f/3.5 Macro lens, serial number 192054704. Why? I already had the Zuiko Digital ED 50 mm f/2.0 Macro, a better lens. But its focal length is frequently a problem, and it has a maximum magnification of 1:2 (area 37.6×26.0 mm), while the 35 mm macro has a maximum magnification of 1:1 (area 17.3×13.0 mm). Both make it convenient for a number of applications, including taking photos while walking the dogs. On 16 December 2015 I received a Zuiko Digital ED 14-35 mm f/2.0 SWD lens, the world's fastest standard zoom lens. The serial number is 180002977. At the same time I also received an EC-20 2× teleconverter, serial number 272012348. I never really used it except for experiments, and I sold it again on 4 May 2017. On 7 January 2016 I received a Zuiko Digital ED 35-100 mm f/2.0 telephoto lens, serial number 170001015. On 21 January 2016 I received an Olympus M.Zuiko Digital ED 60 mm f/2.8 Macro lens, serial number ABQ227050. On 21 September 2016 I received an Olympus M.Zuiko Digital 45 mm f/1.8, serial number ABSA46896. It's as fast as any lens I have bought in the last 50 years, and it's tiny, making a surprising difference from the Zuiko Digital ED 35-100 mm f/2.0 zoom lens. It's difficult to think that, at its focal length, it outperforms the zoom. On 12 October 2016 I received a M.Zuiko Digital ED 30 mm f/3.5 Macro lens, serial number ACBA04378. On 27 October 2016 I took delivery of the first non-Olympus lens for my camera, a Leica Summilux 25 mm f/1.4 lens, which Panasonic perversely call a H-X025E. The serial number is 13091100310. On 18 January 2017 I received a Panasonic Lumix G 20 mm f/1.7 (H-H020AE in Panasonic jargon), serial number 09LG3074803. This is the older of two almost identical lenses, but it scores (marginally) higher ratings in DxOmark's tests. On 31 January 2017 I received a Panasonic Leica DG Summilux 15 mm f/1.7 ASPH., or H-X015E in Panasonic-speak, serial number 75SIC307120N. It is rebadged as a DJI for one of their drones. The EXIF data report it as DJI MFT 15mm F1.7 ASPH, but apart from cosmetics it appears identical to the Summilux. On 28 April 2017 I received a Leica DG Vario-Elmar 100-400 mm f/4.0-6.3 telephoto lens, serial number 27CIF16G019P. On 8 May 2017 I received a Leica DG Vario-Elmarit 12-60 mm f/2.8-4, serial number 07DX6132475D. On 16 June 2017 I received a Raynox 35 mm f/2.8 lens with M42 mount, serial number C52650, free with a set of M42 bellows. The focus does not work, but that is probably not an issue with the bellows. On 15 September 2017 I received a Olympus M.Zuiko Digital ED 8mm f/1.8 Fisheye PRO serial number 347009963. Yes, I already had the Olympus Zuiko Digital ED 8 mm f/3.5 fisheye lens, but there are reasons to believe that the image quality of the new lens is better. On 17 October 2017 I received a used M.Zuiko Digital ED 12-100 mm f/4.0 IS PRO lens, serial number ACC214354. 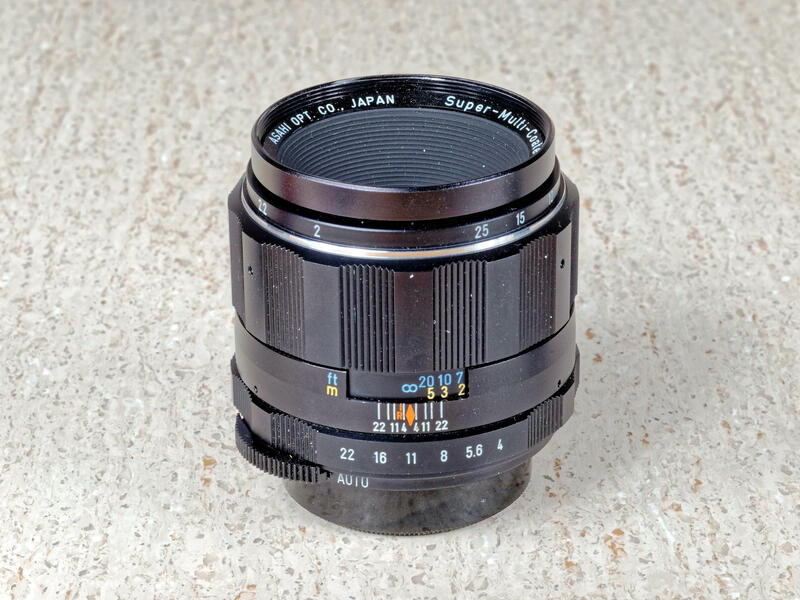 On 25 June 2018 I received a used M.Zuiko Digital ED 75 mm f/1.8 lens, serial number 344018628. Apart from the Olympus digital lenses, I used the lenses from the OM-10 on the E-510. Neither was very good. The 50 mm f/1.8 Zuiko standard lens wasn't as good for macro photography as the 50 mm f/1.4 Super Takumar, and it showed significant flare at very close-up range. The 80-210 mm Tamron telephoto lens was better, but certainly no match for the 70-300 mm lens I replaced it with. To summarize: I've had a total of 47 lenses, of which I still have 30, 21 compatible with the Micro Four Thirds system. The first was a Kakonet, about which I have no further information. I appear to have got rid of it some time in December 1965. Then on 17 August 1966 I bought a Sunpak 7d, serial number 309844. I modified this one to be able to use a smaller condenser, only 16 μF—in those days the power output was not regulated, and the smaller condenser was useful for close-ups. With the small condenser recycle time was under a second. I'm not sure why I even wanted it, though it seems that it had a guide number of 46 with the reflector in “normal” position, making it the most powerful portable flash unit I have ever had. But it was clumsy, and I never used it much. Round 1980 I bought a mecablitz 40 CT 4. I still have this unit. Despite its age, it has a power output comparable with the most powerful of modern flash units. The 40 is an indication of the guide number, but it's at a relatively wide angle setting. One of the issues with this flash is that the contact voltage is 150 V, enough to damage most modern digital cameras. On 9 October 2008 I got a studio flash setup with two 110 J (“Ws”) flashes, umbrellas and stands. 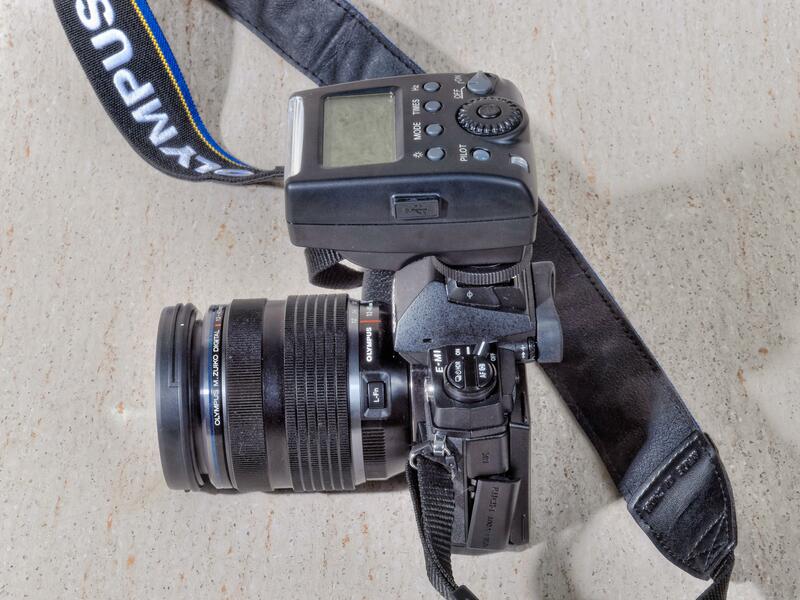 On 12 May 2009 I received a mecablitz 58 AF-1 O digital, which understands the Olympus/Panasonic/Leica flash protocol. Metz seems to have disowned this unit: all that remains on their web site is the firmware download page. This unit has a guide number specified as 58. That looks a lot more than the 40 of the 40 CT 4, but it's measured at “105 mm”, a silly way to refer to 52.5 (!) mm in the Four Thirds format for which it is intended. At “50 mm” the guide number drops to 42, and at 35 mm it drops to only 35, less than the 40 CT 4. In January 2013	the flash tube exploded. Repair quotes were a minimum of half the new price, so I bought a new tube and tried to repair it myself. What a disaster! I got most of the way and couldn't get it back together again. I haven't given up, but it's on the back burner. I was quite happy with it at the time, but it was dimensioned for the E-30, and after getting the E-M1 the ring was positioned too low. In the meantime I've decided that it was just too clumsy, so I won't replace it. 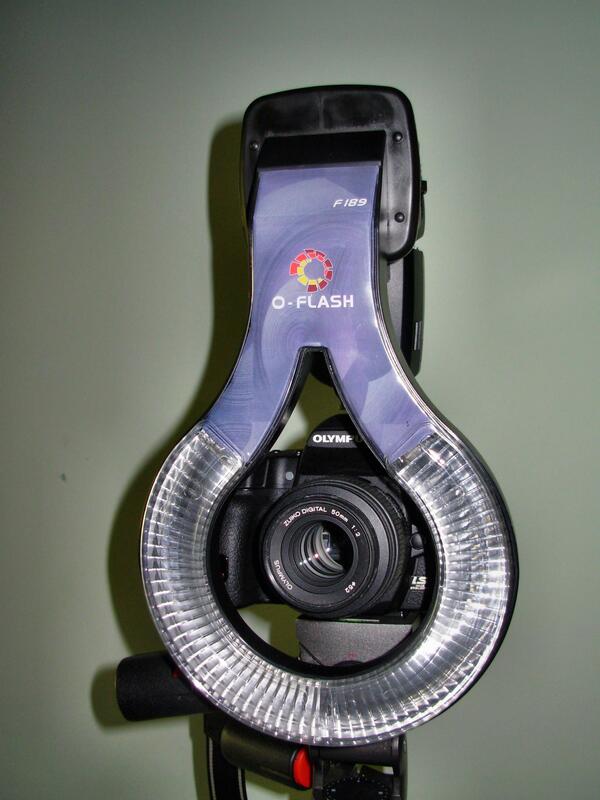 My Olympus OM-D E-M1 camera came with a bundled “flash”, the FL-LM2 with a guide number of 7! It's pretty useless. It has a claimed guide number of 32 (and no focal length adjustments), though I have my doubts. Still, for many things it does the trick. It has proved unreliable, unfortunately: sometimes it doesn't trigger. I have a suspicion that the trigger voltage is too low to work reliably with my cameras. Despite my reservations, on 27 March 2014 I got a new mecablitz 58 AF-2, effectively the same flash with a few new features that I don't need. If I get the 58 AF-I repaired, they can communicate with each other. Yvonne's new Olympus E-PM2 came with another toy flash, this time called FL-LM1. It has the same low guide number of 7 as the FL-LM2, and the other specifications are also identical. Possibly it's just the same flash with different cosmetics to match the appearance of the camera. The Olympus OM-D E-M1 Mark II came with another toy flash, the FL-LM3, this time not quite as much a toy: it can do a few additional things that the older ones can't. It also has a guide number of 9. On 28 October 2014 I received a “Viltrox JY-670 Macro Ring Lite”. I'm still not sure whether that means “light” as in flash, or “light” as in “not the full quantity”?. 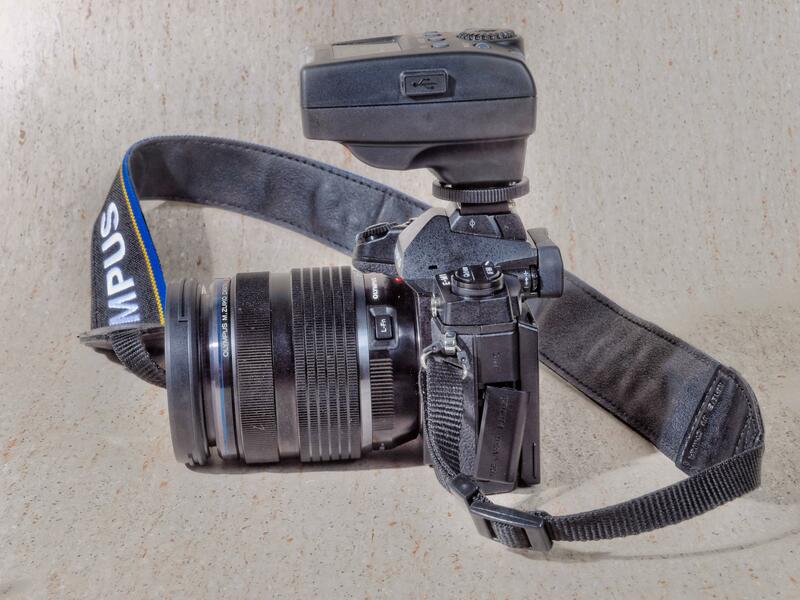 On 17 March 2018 I received a used Olympus STF-8 macro flash unit with two flash heads very similar in appearance to the toys delivered with recent cameras. They have the lowest guide number yet: 6.5. My wife Yvonne also uses a camera, though not to the extent I do. For a while she used my Nikon L1, but in June 2009 we bought her a Kodak M1093 IS digital camera. The price was right, and it was relatively easy for her to use. It has a ridiculously high resolution (the same as for the E-510), but of course the picture quality can't hold up, as my sensor test page shows. It also has an annoying habit of locking up the USB interface, requiring a full reset of the camera before a computer will recognize it again. Kodak agreed to replace the unit, but I have no reason to believe that this isn't a design issue. That problem seems to have gone away, but another, worse one occurred after the one year warranty expired: the camera can no longer focus. I can't imagine it's worth repairing, so after a lot of investigation on bought her a Canon IXY 200F (one of three names by which this camera is known). In Asia that's the name, in Australia it appears to be called IXUS 105, as it is in Europe, and in the USA it's called a PowerShot SD1300 IS Digital ELPH (what a mouthful of mumbo-jumbo!). Why do people have to obfuscate names so much? In the course of time, the IXY 200F developed similar problems; I assume it's related to the dusty environment in which Yvonne takes many of her photos. It seems that cheap digital cameras aren't designed to cope with that. I've taken to trying to use the camera as a replacement for my Nikon, but it's not clear whether I can get the focus issues sorted out. There's lots of other stuff that goes towards camera equipment, of course. This section is a work in progress itemizing some of it. In the 1960s I gradually stopped needing exposure meters, since even then the cameras had them built in. But as a result of problems with flash exposure, on 11 November 2014 I received a new Sekonic L-308S exposure meter, mainly for flash exposures. It works well, and it shows significant differences in the automatic exposure offered by flash units. I'm still trying to understand what is happening. This meter has a strange way of displaying apertures. I have a conversion table.